Tsunamis triggered by volcanic eruptions are relatively rare, caused by the sudden displacement of water or “slope failure”. 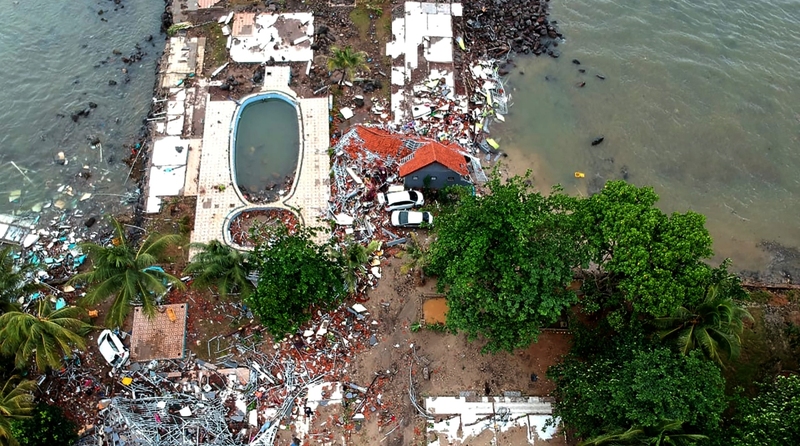 A volcano-triggered tsunami has left at least 222 people dead and hundreds more injured after slamming without warning into beaches around Indonesia’s Sunda Strait, officials said Sunday, voicing fears that the toll would rise further. Hundreds of buildings were destroyed by the wave, which hit the coast of southern Sumatra and the western tip of Java about 9:30 pm (1430 GMT) on Saturday after a volcano known as the “child” of Krakatoa erupted, national disaster agency spokesman Sutopo Purwo Nugroho said. Dramatic video posted on social media showed a wall of water suddenly crashing into a concert by pop group “Seventeen” – hurling band members off the stage and then flooding into the audience. In a tearful Instagram post, frontman Riefian Fajarsyah said the band’s bassist and road manager had been killed and his wife was missing. Search and rescue teams were scouring rubble for survivors, with 222 people confirmed dead, 843 people injured and 28 missing, Nugroho said. Tsunamis triggered by volcanic eruptions are relatively rare, caused by the sudden displacement of water or “slope failure”, according to the International Tsunami Information Centre. Unlike those triggered by earthquakes, they give authorities no time to warn residents of the impending threat. The destructive wave left a trail of uprooted trees and debris strewn across beaches. A tangled mess of corrugated steel roofing, timber and rubble was dragged inland at Carita beach, a popular spot for day-trippers on the west coast of Java. Photographer Oystein Andersen described how he was caught up in the disaster while on the beach taking photos of Anak Krakatoa. “I suddenly saw a big wave,” he wrote on his Facebook page. “I had to run, as the wave passed the beach and landed 15-20m inland. (The) next wave entered the hotel area where I was staying and downed cars on the road behind it.” Asep Perangkat said he was with his family when the wave surged through Carita, carving a swathe of destruction. “Cars were dragged about 10 metres and so were containers,” Perangkat told AFP. “Buildings on the edge of the beach were destroyed, trees and electric poles fell to the ground. In Lampung province, on the other side of the strait, Lutfi Al Rasyid said he fled the beach in Kalianda city, fearing for his life. “I could not start my motorbike so I left it and I ran… I just prayed and ran as far as I could,” the 23-year-old told AFP. Kathy Mueller from the International Federation of Red Cross and Red Crescent Societies said the toll was likely to rise as the conditions on the ground became clearer. “The situation, and the death toll, will remain fluid over the next days and even weeks,” she told AFP. 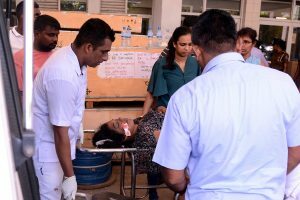 Teams of aid workers were helping to evacuate the injured and bring in clean water, tarpaulins and provide shelter, she added, saying the group was preparing for the possibility of diseases breaking out in the tsunami zone. Anak Krakatoa, which forms a small island in the Sunda Strait between Java and Sumatra, emerged around 1928 in the crater left by Krakatoa, which erupted in 1883 killing at least 36,000 people. “The cause of the undersea landslide was due to volcanic activity of Anak Krakatoa, which coincided with a high tide due to the full moon,” Nugroho told reporters in Yogyakarta. He also said the death toll would likely increase. Indonesian authorities initially claimed the wave was not a tsunami, but instead a tidal surge and urged the public not to panic. Nugroho later apologised for the mistake on Twitter, saying because there was no earthquake it had been difficult to ascertain the cause of the incident early on. “If there is an initial error we’re sorry,” he wrote. The wave swamped parts of the coast around the Sunda Strait, leaving at least 164 people dead in worst affected Pandeglang district on Java’s western tip. Large numbers of casualties were recorded at two hotels in the area. Eleven people died further north in Serang, while 48 were killed in South Lampung, on Sumatra island. 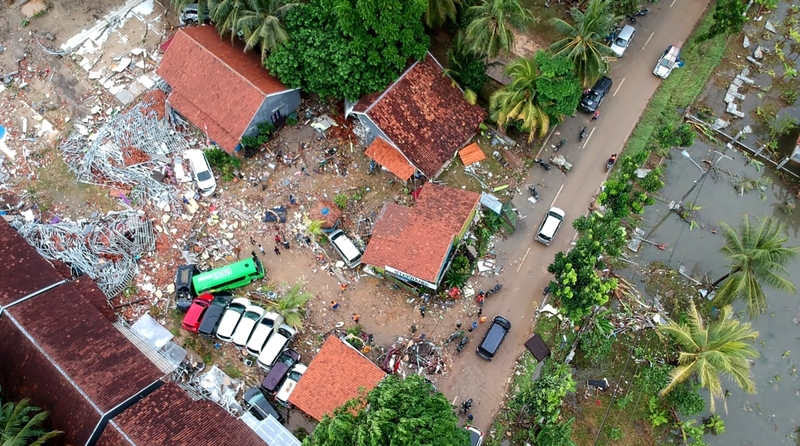 “This number is predicted to increase because not all victims have been successfully evacuated, not all health centres have reported victims and not all locations have got complete data,” Nugroho said. Heavy equipment was being transported to badly hit areas to help search for victims and evacuation posts and public kitchens were being set up for evacuees, he added. According to Indonesia’s geological agency, Anak Krakatoa had been showing signs of heightened activity for days, spewing plumes of ash thousands of metres into the air. The volcano erupted again just after 9:00 pm on Saturday, the agency said. Indonesia is one of the most disaster-prone nations on Earth due to its position straddling the so-called Pacific “Ring of Fire”, where tectonic plates collide. Most recently in the city of Palu on Sulawesi island a quake and tsunami in September killed thousands of people. On December 26, 2004 a tsunami triggered by a magnitude 9.3 undersea earthquake off the coast of Sumatra in western Indonesia killed 220,000 people in countries around the Indian Ocean, including 168,000 in Indonesia.